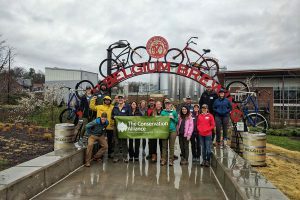 The Conservation Alliance Kicks Off First Backyard Collective Stewardship Event of 2019 in Asheville, N.C.
BEND, Ore. (April 10, 2019) – The Conservation Alliance held its first Backyard Collective event of the year in Asheville, North Carolina on Friday, April 5. The stewardship project drew 25 volunteers from six member companies and five conservation partners. The volunteers worked in support of Asheville’s RiverLink to remove 500 pounds of waste along 1.3 miles of road along the French Broad River. The group also cleared a 500 square feet of invasive plants in the future Karen Cragnolin Park, a new Asheville green space. Conservation Alliance member companies Eagle’s Nest Outfitters, Farm to Feet, Grassroots Outdoor Alliance, KEEN Footwear, Merrell, and New Belgium Brewing participated in the event. CLIF Bar generously donated energy bars for all attendees. The mission of The Conservation Alliance is to engage businesses to fund and partner with organizations to protect wild places for their habitat and recreation values. The Conservation Alliance launched the Backyard Collective program to give member company employees in the outdoor industry the opportunity to work together on a local stewardship project while learning more about organizations that receive funding from the group. Conservation Alliance grantees joined in a grantee fair to share current information and calls-to-action about their programs. Grantees included American Whitewater, Carolina Climbers Coalition, Conserving Carolina, Outdoor Alliance, and The Wilderness Society. The Backyard Collective moves that action to their local community, and gives these employees a venue to get their hands dirty for the sake of conservation. For more information about this event, please contact Abby Becker, Backyard Collective Outreach Coordinator at abby@conservationalliance.com. The Conservation Alliance is an organization of like-minded businesses whose collective contributions support grassroots environmental organizations and their efforts to protect wild places where outdoor enthusiasts recreate. Alliance funds have played a key role in protecting rivers, trails, wildlands and climbing areas. Membership in the Alliance is open to all companies who care about protecting our most threatened wild places for habitat and outdoor recreation. Since its inception in 1989, The Conservation Alliance has contributed more than $22 million, helped to protect more than 51 million acres of wildlands; protect 3,107 miles of rivers; stop or remove 34 dams; designate five marine reserves; and purchase 14 climbing areas. For complete information on The Conservation Alliance, see www.conservationalliance.com.